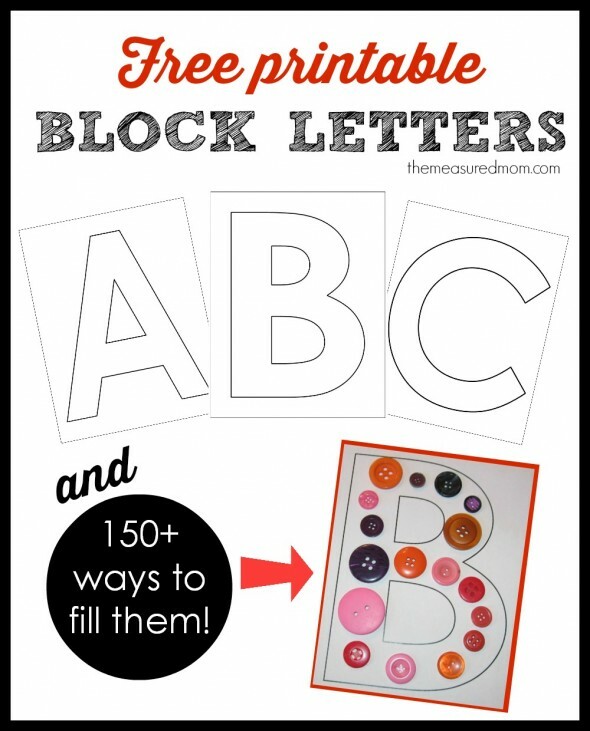 Printable block letters… and over 150 ways to fill them! Many of you have been following along as we explore the alphabet in creative ways. Since it takes us more than a week to do each letter, you’re also passing us by. We plan to have the entire alphabet and activities posted by mid-November. But if you’re zooming past us, I thought you might appreciate these giant block letters with ideas for filling them. What a hands-on way to learn the alphabet! We learn about letters in a variety of ways. When I’m first introducing the letter, I like to print a giant block letter and have my kids fill it in with objects that begin with that letter. As they’re working, we talk about what they’re using as a way to reinforce the letter and sound. Today I’m sharing over 150 ideas for filling up giant letters. At the end of the post you can download your own free set of giant block letters. Throughout the list you’ll find links to Amazon products to help you find what you need. Have fun! Want to see sample letters from A-Z? Check out the lovely collages at Teacher Types! 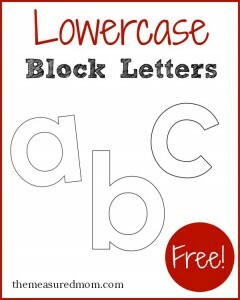 Lowercase letters are now available! Click here! I *LOVE* this idea! So many fun hands-on way to learn letters. I wish I had this about a year ago! lol! I can use this so much for bulletin boards! At the beginning of the year, I can have the kids spell their names, and paste or draw things about themselves inside. Or, overlap the letters for a place they went in the summer, or something they did, and draw details inside the block letters. (Have done that before, but I (or the kids) had to draw the letters (which was not always a pretty sight!) Thank you so much! You have gone and done it again!!! The pre-k I am doing with my 3 year old this year comes with these funky looking capital letters that I just don’t like at all. I am going to print these letters on cardstock and let my 3yo use these instead for her weekly letter crafts. THANK YOU! I”m so glad these will be useful for you, Elaine! Thanks for all of these! I use them to work with adults with cognitive delay on my job. I really appreciate your efforts! It’s always fun to hear when something I create is useful for teaching adults, too. I’m glad you can use them, Peggy! 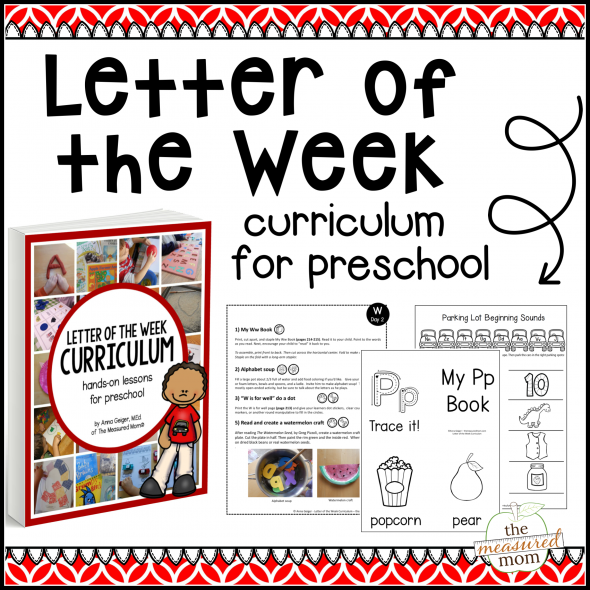 Do you have giant lowercase letters to go with the uppercase? I would love to have the kids do a combo of capital and lowercase at the same time. Erin, I did not think of doing those, but that would be easy. I will try to add those in the next month or so. Just found your website. I teach a preschool class of three year old (10). Should I make copies for each child to do so they can take them home or make some and put in a center. Any suggest. Hi Lisa! I think these would work great in a classroom center. If you regularly send home ideas for parents to supplement what their kids are learning, this could also be a great at-home activity. You are welcome to photocopy the pages to send home with your students. I jut found your site today. This is awesome. I really love this. I’m glad you found my site, Amisha! I hope you find a lot more you can use! My ABC book does not include printables. It includes lesson plans that include the printables (with links to them). The link to block letter uppercase and lowercase printable isn’t working. These are awesome, thank you! There are so many things we can do with these letters! Any chance you have numbers that are in this block style too? I’m so glad you can find a use for this, Maliha! Hi Anna, I’m trying to get the capital block letters, but when I click to download, it asks for my email and first name, but no download. I don’t see a link for a download in my email either. Is there some way to access this resource? Thank you! This is Kate, Anna’s assistant. Please enter your email address, and then check your email. If you don’t see it right away, please check your spam, junk, trash, or promotions folders. Thanks! These are great! We love to use simple things that can be used multiple ways.